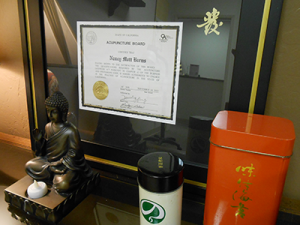 At Valley Acupuncture, we address the overall functional health and well-being of our patients. We have found that a patient’s desired effect can be achieved via our more subtle and highly-effective approach to acupuncture. Our calm and peaceful atmosphere supports healing and encourages relaxation, and we work with patients to promote Health and Vitality at Every Age. Acupuncture is a 3000 year old medical practice that Western Medicine is recognizing as a safe and effective treatment-method for many conditions. Acupuncture treatment involves the stimulation of specific points along meridians or channels throughout the body. This is done by placing super-thin needles through the skin at precise points in order to correct imbalances in the system. Please rest assured that we only use sealed and sterile, one use, disposable needles, and most first-time patients are surprised to see just how fine the needles are. The acupuncture needles we use are sterile, one-use needles made from stainless steel. As a result they very flexible and made to a very small diameter; as fine as 0.16mm. Because of this, and because Nancy is highly skilled at what she does, there is very little sensation when the needle pierces the skin. There may, however, be a slight tingle, localized sensation, or reflexive response when the needle comes in contact with the flow of energy within the body. While not frequent, it can be considered common, however, it is typically not described as a “painful” sensation. In comparison to western medical treatment which often include drugs and complex treatment regimes, acupuncture can deliver effective results, typically without side-effects or a commitment to an complex, long-term treatment plan. With acupuncture, results can be seen in 2-12 treatments. For those who have had acupuncture before, it may help to know that we do not flick or spin the needles once inserted. Our approach is effective, without that additional, and often uncomfortable, stimulation. Because each case is different, we are happy to discuss your symptoms and concerns so that you can decide if this is something that would make sense for you to do. We specialize in treating a range of women’s health issues including fertility and infertility, PMS, peri-menopause and menopause. In addition, we offer proven acupuncture techniques for non-surgical facial rejuvenation and artful aging. Valley Acupuncture sees patients with a wide variety of complaints and has successfully treated these, as well as countless other, more complex and subtle issues. Your Health is Our Concern – If you have specific questions about how acupuncture could help you, we hope you will be in touch. Nancy is available for a free consultation so that you can determine if this is the right fit for you. Feel free to call 408-835-7870 or Email Nancy via our Contact Page.